For years, I’ve been a serial over-packer. I would bring a full-sized upright for a 4-day trip. Lately, I’ve been loving the art of downsizing – only keeping the essentials. I’ve challenged myself to pack for a week-long trip using only carry-on baggage or a backpack. As a female traveler, I often bring that extra pair of dressier shoes, a dressier outfit, and some accessories just in case. You never know when you decide to attend an event, or decide to check out a restaurant with a dress code. With that extra dressier ensemble going into my carry on, what’s a girl to do for fitting everything in? 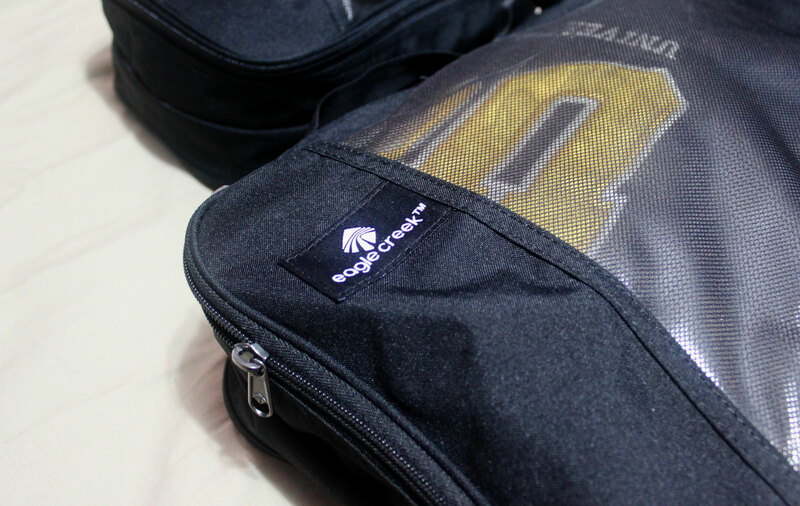 Introducing the Eagle Creek Pack-It packing cubes. Eagle Creek is one of several manufacturers who create these space saving items that, in my opinion, are a must, especially for those looking to buy souvenirs or do some shopping. These cubes are making their rounds on bloggers’ sites and into people’s luggage for their ability to condense the space used up in your luggage. How they work is they compress extra air out of your clothing. Each cube has a mesh panel to really squeeze the air out, leaving only the clothes you’re packing. To be extra space saving, you can roll your clothes into the cubes (which is a great way to maximize space even without the cubes). When done properly, rolling clothes can also prevent any creases and wrinkles so your clothes are ready to be worn. The cubes come in a variety of colours and sizes so I bought different ones. The half cube is the empty one on the bottom of this picture, and easily fits more than a dozen shirts rolled up. The longer tube cube can be used for things such as underwear and socks, although I use it for dresses or jeans. Believe it or not, that tube cube held 3 pairs of my jeans! The two at the top, I had left some articles of clothing in so you could see it filled. These are Clean Dirty cubes, in full size (left) and half size (right). They are double sided so you do not have to worry about your clean clothes mixing with dirty items, making it also convenient for doing laundry after coming home! Luggage organization is easier now that I have these cubes to compartmentalize what I’m packing. All my tops and dresses go into a half cube, my bottoms roll up into a tube cube, and the Clean Dirty bags hold my undergarments (half size) and bulky items (full size). I’ve never had issues with these in my carry on, but it does add the convenience of removing only one cube for security to inspect, if needed, instead of ruffling through your clothing. There is one incredibly important thing to note about using packing cubes, especially for over-packers. If you decide to fill these with a month worth of clothing for a week long trip, note that while these cubes save space, they do not save weight. Think about it. You are still packing the same amount of clothes, just condensing it. Know what your baggage limits are before your flight, and pack accordingly. Also, if you’re packing these into a backpack, consider how much weight is comfortable for you to carry. 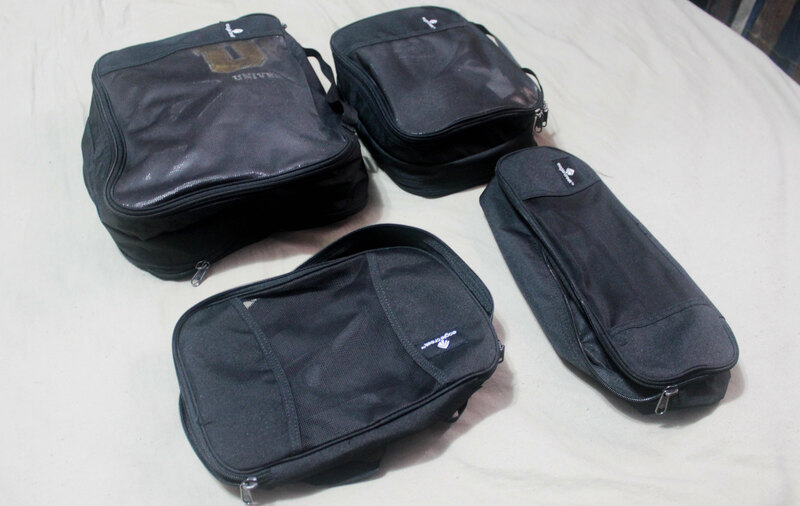 Do try these packing cubes – I personally got mine on sale at one of the Premium Outlet locations, and do remember to keep your luggage weight in mind! I hope this post has made your packing conundrums a little more manageable. Good luck and get packing!